fabric can be found any where, every fabric stores have variety of fabrics with lot of colors. its seems there is lot of designs and varieties of fabric and color. but its still very hard to find what exactly you are looking. you get very lucky if u find the fabric easily what u want. most of time when u go to buy fabric u change your mind after check availability. but we still have remain our dream or idea to make special . 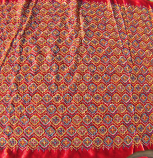 selling fabric online is not easy as there is wide ranges with colors, styles, designs etc. but we have selected some designs and fabric you can order with any colors. also if you specify to us what you are looking for we find best available fabric for you. Very unique design. This skirt has little jingle bells all around the waist and makes a pretty noise. The veil is very detailed, and has mirror decorations on it so it shines in the light. Beautiful dress!